Nothing at all to do with innkeeping. Not a smidge. Pick a word. Just one. Pick a noun to narrow it down. My first noun was also Tree, same as Copperhead. Ok, now the reason... I'm making a list of books to read for my book group. I'm going to pick books with the same word in the title, one for each month. This is a lot easier than getting 20 people to agree on one book every month. So, rather than a plot theme, a word in common. I need 12 of them with that in the title. That's one book that has never let me rest quietly. Amazed I continued to read her after that one. And actually like her stuff, just not that one. Basketball - I'm thankful the season/finals are almost over! Sunshine...it just showed up after 2 days of rain and fog! My garden is smiling and so am I! Tree - thankful for the shade it provided me working in the yard today. Woodpecker. 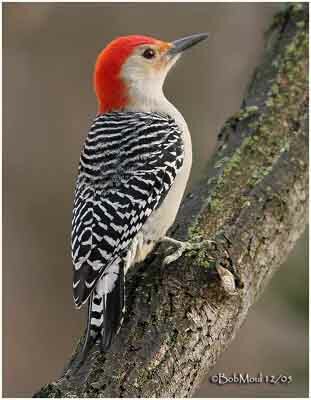 Because there's a red-bellied woodpecker on the feeder outside my window at this very moment. we recommend leather - we have 2 in the guest lounge, been in a year look like brand new - im a great believer in leather as it takes the hammer! Yes Cams. I think also along the same lines. I have two now . But have only one that has stood the test of time. Just have to find away to make it look comphy. Leather has the ability to look Manly or cold. I am thinking of trying a red or a dark cranberry if I can find one. My rug is a beige to a cream mix. Maybe change one feature wall with a dark red as a accent wall to match.??? but have a brick fire place so have to be careful. I am not steeling Maddies . As she has said why she is doing this thread.